DC Password And Encrypted Data Manager Doc - Miscellaneous Functions - Douglas Computing, Inc. 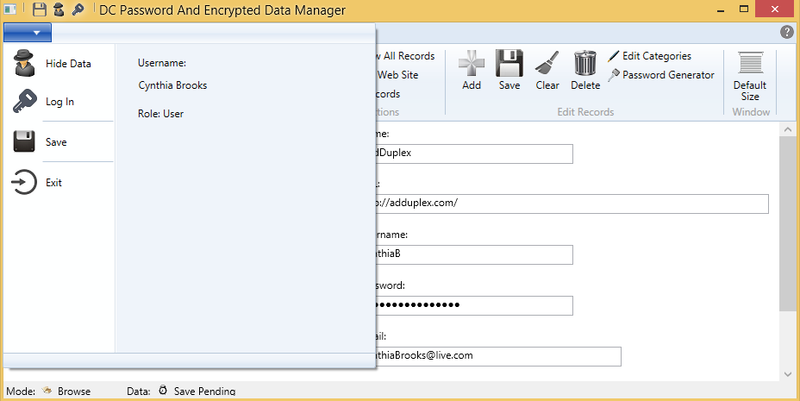 The DC Password And Encrypted Data Manager contains several important features which can be accessed via the application's title bar, as well the application's menu, shown in the screenshots above. These features are the Save Data, Hide Data, and Login features. When you save a record, you save the record data to memory. However, all records used by the application are saved to files on disk. Adjunct information such as settings, are also saved to disk. As you use the application, various data are saved to disk automatically - mostly in an asynchronous manner. Saving data asynchronously makes your application operate smoothly. Apart from automatic data saves to disk, you are able to manually initiate the asynchronous saving of all pending data to disk, by clicking on the Save button on the left of the application's title bar, or on the Save menu command in the application menu. (See screenshots above.) This might be helpful if would like to ensure important information you just entered into the application is saved safely to disk. 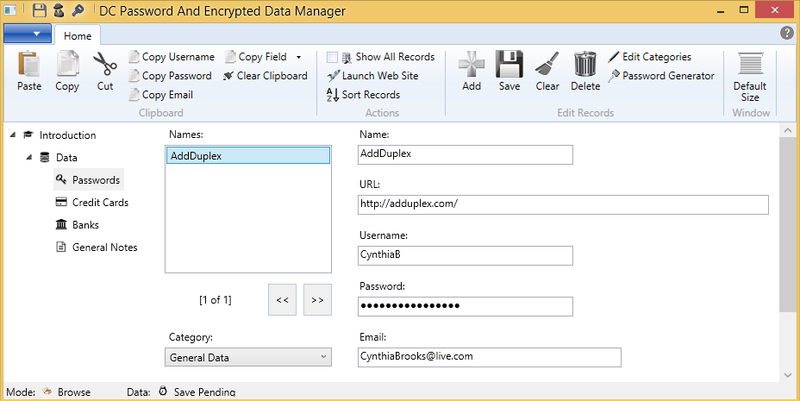 This might also be helpful if you are using several copies of the application on several Windows devices, and you have the application's data in identical folders associated with an online drive service such as Dropbox, which synchronizes your data. Clicking on the Save button, would save your data locally, and also initiate the synchronization of the data among all your relevant Windows devices. If you are worried about people casually glancing at your computer screen, and reading your data, you may click on the Hide Data button on the left of the application's title bar, or the Hide Data menu command, in the application menu. Clicking either Hide Data button brings up the following screen. The above screen hides your data from view, while presenting helpful metadata about your application. If would like to see your data again, simply click on the Back button, near the bottom center of the screen. 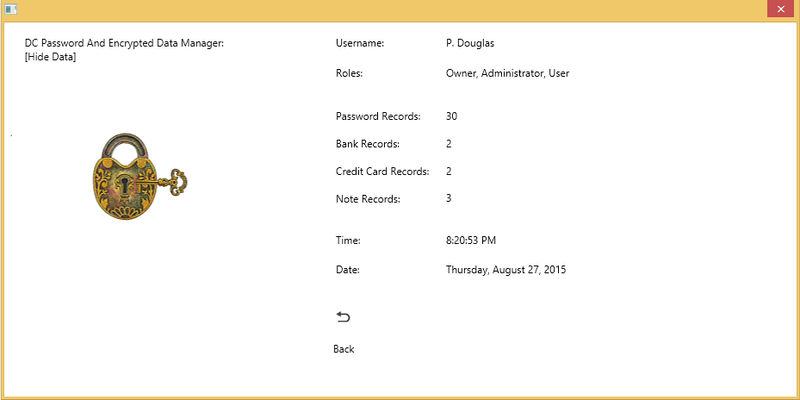 If you would like to step away from your PC, and ensure that no one is able to read your data while you are away, you can click on the Log In button on the left of the application's title bar, or the Log In menu command, in the application menu. Clicking either Log In button brings up the following regular login screen. 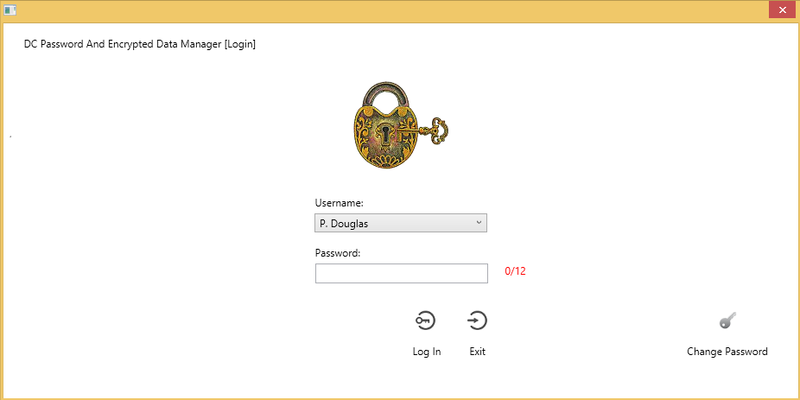 You can alternate click on either Log In button, to log a new user into the application.